So simple to make, yet so much loved by my workmates! Buy 500g of good quality sausages - any kind will do - I always get mine from the markets, they're so much yummier. The best so far have been beef & red wine, but honey & rosemary lamb sausages were good too. Cut off the "skins" and place each sausage on a sheet of puff pastry (I use the square instant frozen stuff, but you could make your own) - if they don't quite fit just squish off a bit and reshape or add on extra bits. Then roll the pastry over the sausage circumference, then along the corner of where you're going to roll pastry on to pastry, use a teaspoon to dab a small line of tomato chutney (I use the Outback Spirit Bush Tomato Chutney) then continue the roll. Eggy wash the final join and then the entire roll. Place the cylindrical roll-up back in the freezer or fridge as you make each roll. 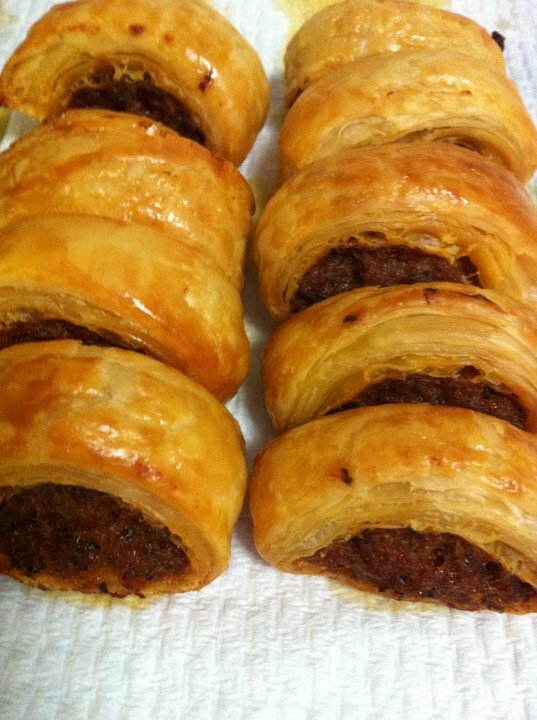 Then take them back out and using a sharp knife cut each long roll into 1-2cm wide sausage rolls. Place them onto baking tray or sheet lined with baking paper and bake. I can't remember how long I bake mine for, usually I do them at 200 (210 in my oven) degrees for 15-20 minutes (or the time it takes to get ready for work) or until the pastry is golden and the meat is cooked through. Then when you nom them, biting into them unleashes a delicious self-saucing burst of tomatoey goodness. Bonus! Give them a try, literally takes no time at all and is sure to cheer up everyone at work, or a party for those of you who have social lives! There is only one word that can describe the inspiration here- Genius! Actually inspired by one of our nightshift co-workers' homemade sausage rolls where I've worked with you, can't remember who though!!! The self-saucing idea came from a cooking show or magazine, can't remember which. Seriously always a joy and everyone is soooo impressed - don't tell them it's so simple! So, I made these last night for my bestie's annual "Bad Santa" screening party. Thanks to Woolworths Online stuffing up my order, we now know that the recipe works perfectly fine with rissole meat as well as sausages - and no need to skin anything! Huzzah! Yum, I'm definitely going to give these a try. Can't believe they're so easy... sausages and rissole meat reinvented! Genius!